Protective Thermometer Wallet for SuperFast ThermapenThermometers - These black, faux-leather protective wallets are ideal for transporting and protecting your Thermapen thermometer. The thermometer wallets are manufactured from soft PVC imitation leather, and shield the instrument from everyday knocks, bumps and scratches. 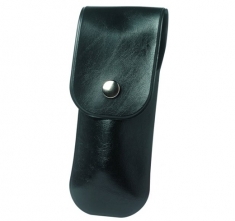 Each wallet has a secure press stud fastening and is provided with a belt-loop.